U.S. officials, including Dr. Sarah Sewall, the Under Secretary for Civilian Security, Democracy, and Human Rights at the U.S. Department of State (center left), and U.S. Ambassador to Bangladesh Marcia Bernicat (center), listen to the accounts of Peace Ambassadors. On March 30, 2016, the International Foundation for Electoral Systems (IFES) hosted a meeting in Dhaka, Bangladesh with several U.S. Government officials including Dr. Sarah Sewall, the Under Secretary for Civilian Security, Democracy, and Human Rights at the U.S. Department of State. In the meeting, Dr. Sewall discussed the present political situation in Bangladesh with eight Bangladeshi “Peace Ambassadors” (Shanti Dut Gon in Bangla) and two members of the Women’s Active Voice in Elections (WAVE) Advisory Group. U.S. Ambassador to Bangladesh Marcia Bernicat, Deputy Assistant Secretary for the Bureau of South and Central Asia Affairs Manpreet Anand, Deputy Assistant Secretary for the Bureau of Democracy, Human Rights and Labor Robert Berschinski, and other U.S. State Department and U.S. Agency for International Development (USAID) officials also attended the event. The eight Peace Ambassadors have been trained under IFES’ People Against Violence in Elections (PAVE) program to better understand the root causes of violence, learn how to deal with conflict related to the electoral process, and foster dialogue between opposing groups. Similarly, the WAVE Advisory Group is working to develop a common advocacy platform to promote peaceful, violence-free elections and encourage women’s participation and leadership, utilizing their networks and expertise. 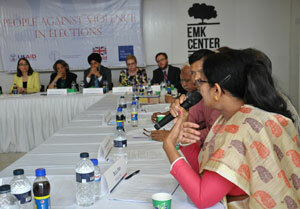 The meeting provided an opportunity for U.S. government officials and Bangladeshi activists, who are working to promote peaceful elections and political processes in their respective spheres of influence across Bangladesh, to have an informal and frank dialogue on the issues faced by the country’s community advocates, while also inspiring them to continue working to prevent the outbreak of violence around elections and political processes. The Hunger Project Bangladesh, IFES’ local partner on the PAVE project, also presented information about the field implementation of PAVE in the current political and electoral context. Peace Ambassadors highlighted the persistence of violence in their communities, whether incited by extremist viewpoints or longstanding ethnic divides. Many noted the various ways that PAVE allowed them to take a leading role in mitigating conflict, and urged the expansion of PAVE across Bangladesh. Bulu Ray, a Peace Ambassador from Khulna, recounted an incident where extremists from outside her area attacked the community with small explosives. When members of her community mounted a violent resistance, the PAVE alumni in the area intervened to conduct dialogue with the religious leaders and community members to mitigate the violence. Tuku Talukder, a WAVE member from the ethnically divided Chittagong Hill Tracts region, said that IFES support has enabled her to initiate programs to create trust among community members in spite of deep-rooted mistrust among ethnic groups, and to build the capacity of indigenous women leaders to address conflict. The Peace Ambassadors were also optimistic about the progress they hope their communities will achieve as a result of PAVE. Community groups of PAVE-trained participants, called Peace Pressure Groups (PPG), have been formed to support the peacebuilding activities of the Peace Ambassadors. Peace Ambassadors highlighted that these groups have also been instrumental in mitigating violence in their communities. Mohammad Abbas Uddin, Peace Ambassador from Jessore, said with the help of PPG members, he was able to reduce violence in his upazila (sub-district) by bringing mayoral candidates together before the municipal election and urging them to publicly disavow electoral conflict. Bulu Ray, Peace Ambassador from Khulna, addressing U.S. officials. Saiful Islam Badsha, Peace Ambassador from Rajshahi, said that the interventions of the Peace Ambassadors and PPG members in his area will ensure that there will be no violence in the Union Council elections. Dr. Badiul Alam Majumdar, Country Director of The Hunger Project Bangladesh, emphasized the value of PAVE as a program that builds the demand for peaceful and democratic governance, the cornerstone of a peaceful country with a civilized method of transferring power between political leaders. He warned that stolen elections and corruption can lead to radicalization. Although PAVE works at the local level, Majumdar expressed his hope that PAVE will help create a momentum that will eventually permeate throughout the country and all levels of government. As the event drew to a close, U.S. Ambassador Bernicat expressed her support for the PAVE program and the Peace Ambassadors. Under Secretary Sewall thanked the participants for sharing their views. IFES is an implementer of the “Bangladesh Election Support Activities” (BESA) program, which began in 2013. USAID and the United Kingdom Department for International Development are joint funders of the PAVE and WAVE programs launched under BESA.